Current predictions from USDA/NASS for corn and soybean production in Missouri in 2014 is 562.8 and 259.9 million bushels. If realized, those would be record production levels for both crops. To put that in perspective, if the total number of bushels (822.7 million) predicted to be produced in Missouri was piled on to a football field (pile has straight sides equal to football field dimensions), the pile would be slightly more than 4 miles high. That’s higher than some commercial airplanes fly. A railroad hopper car carries about 4200 bushels. It would take over 195,000 cars to carry Missouri’s predicted corn and soybean production. Those cars would equal a train about 2200 miles long. A train that long would reach from St. Louis to Kansas City nearly 9 times. Even if late season stress or disease decreases yields slightly, Missouri farmers will have some hard decisions to make on where and how to store or transport their crops. University of Extension has a team of experts working on collecting information that will benefit farmers making temporary grain storage decisions. Many Missouri farmers do not have enough on-farm storage to handle a record crop. 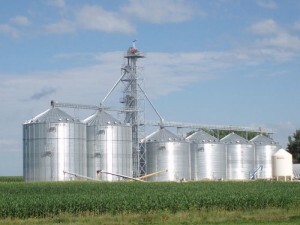 And, most elevators and other commercial grain storage sites will quickly fill with grain. Because of current transportation challenges (lack of hopper cars and engines to pull them) grain will not move quickly from farm to end-user. The cooler temperatures we enjoyed this summer are partly responsible for the record yields, but they also slowed corn grain maturity. Corn plants will reach black layer later than usual this year. This means that corn grain will likely be harvested at higher grain moistures than in the recent past. So, farmers will incur greater drying costs. Because of the large corn production throughout the Midwest, propane and other energy sources used for drying grain might become more difficult to obtain. Planning in advance of harvest will be important to ensure corn grain can be dried to safe storage percentages. Because grain prices are low, farmers might be tempted to leave corn in the field longer than normal to allow for greater in-field drying. This action can increase preharvest and harvest corn yield losses. Delayed maturity means that air temperatures during in-field drying will probably be cooler than normal. This means a greater number of days to reach a target grain moisture. More days means increased exposure to unpleasant weather events such as wind and rain. It also means additional days for stalk rot fungi to cause their damage to stalk and ear shank strength. There are also fungi that do not cause diseases, but digest dead tissues. Mature plants die and these saprophytic fungi begin to break down tissues even before harvest occurs. Cooler temperatures will decrease activity of all these fungi, but they are still active and may increase stalk lodging and shank breakage. Soybean maturity will also be later because of the cool summer temperatures. But, because soybean maturity is closely tied to photoperiod length, the delay for soybean will be much less than delay for corn. Soybean seeds dry (and rewet) in the field more quickly than corn kernels. Except in extreme situations with late planting, soybean grain moisture is not likely to be a concern. The two biggest enemies of grain storage are moisture and temperature. Greater moisture percentages and warmer temperatures increase the growth and activity of grain storage pests, especially fungi. At physiological maturity (black layer for corn and R7 for soybean) seed moisture percentage is about 32 and 60% for corn and soybean. Although the plant dies at maturity, the seeds (grain) remain alive. Respiration occurs in living seeds even when removed from the plant and stored. One product of respiration is water. The purpose of respiration is to produce energy, and the by-product of that energy the production of heat. Stored grain will increase in moisture percentage and temperature unless seed respiration is reduced or eliminated. One of the purposes of grain drying is to reduce respiration to a minimum that is nearly equal to zero. The seed embryo remains alive, but it is not producing water or generating heat. This drying occurs naturally in the field for soybean, but artificial drying is often necessary for corn. Safe year round storage moisture is 13% for corn and 12% for soybean. This low moisture is necessary to store grain through the hot and humid months of summer. If grain temperature is cool (e.g. less than 50F), then grain can be stored at higher moistures. One of the purposes of aeration (air movement without heat) is to cool the grain and remove some of the moisture generated by respiration. Storing grain outside presents several challenges. It would be quite expensive to dry grain to 13% moisture. So, most farmers will attempt to store grain at moisture percentages that allow seed respiration to occur. Some temporary storage solutions, such as grain bags, will not allow aeration and this presents a challenge to dissipate heat and moisture unless respiration is limited by cool air temperatures. Another method of preserving stored grain is through reduction of oxygen. Seed respiration and fungi growth require oxygen. If oxygen levels are reduced, then seed production of heat and moisture is also reduced. Growth of fungi responsible for grain spoilage is also slowed or prevented. This is what happens in high moisture corn storage. Corn at moistures around 28% is placed in nearly airtight bins. Rapid seed respiration quickly reduces oxygen to near zero and grain is preserved. It not easy to predict the consequences of placing grain at more moderate moistures, e.g. 18%, in airtight bags. Respiration might be fast enough to reduce oxygen to safe levels before grain spoilage. However, localized wet areas from respiration generated moisture are possible. Record yields mean that Missouri farmers have many decisions to make about grain handling and storage. Low grain prices complicates some of these decisions and increases the need for safe, but long term, storage. Attention to details is important to maximize grain production, but that attention doesn’t end at the combine. Save storage, especially of grain placed outside in temporary storage, will be a challenge. Seeds are living organisms and understanding how they react with potential enemies and weather conditions will help maintain grain quality and value.